Arizona Native Status: Introduced. This naturalized weed is native to southern Europe. Habitat: Desert, Upland. 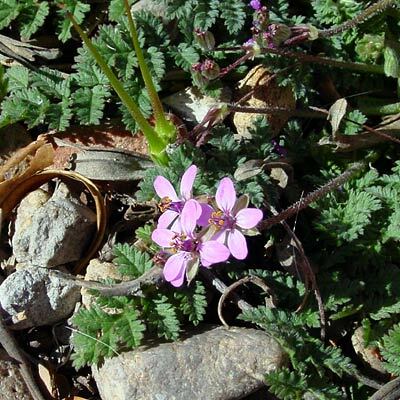 It grows in flat, open, disturbed areas. 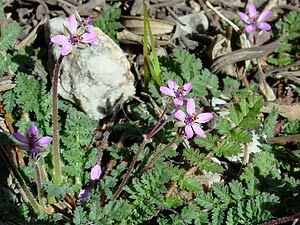 Description: The flowers are 1/4 inch (0.6 cm) wide and have 5 petals and 5 sepals. The developing green seeds look like a stork bill. The mature seeds are point-tipped and have a coiling and uncoiling tail that self-buries them when they get wet. The leaves are in a flat basal rosette and are dark green and pinnate with pinnately cleft leaflets. The stems are reddish and hairy. The seeds can be a hazard to dogs and other animals. Because the seeds have a sharp pointed tip, coil themselves up, and can move and try to bury themselves when they get wet, they can become tangled in a dog's fur and then penetrate its skin in an attempt to bury themselves. Poisonous – This otherwise edible plant can accumulate toxic levels of nitrate from the soil.